The Rowan women's swimming and diving team celebrates their NJAC title after defeating TCNJ. Photo courtesy of Sports Information. 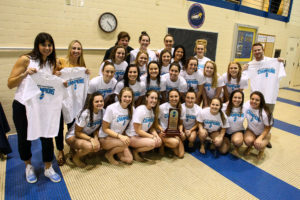 Another year of dominance is in favor of the Rowan women’s swimming and diving team. 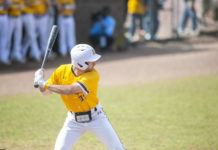 The Profs captured their second consecutive New Jersey Athletic Conference (NJAC) title under four-year head coach Brad Bowser this past Saturday against The College of New Jersey. Rowan won 220-77, as this was their highest scoring meet of the season and the fourth time they’ve defeated an NJAC opponent by more than 100 points. Bowser was nothing short of proud of his team for accomplishing the feature this year. Now, usually this would be the part where stats from the conference-clinching meet against TCNJ would be inserted, but Bowser pretty much summed up everything he liked (which was basically everything the Profs did) during our interview, so here’s that. 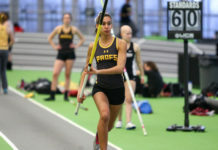 Although there is just one more meet before the Metropolitan Championships from Feb. 16-18, “Mets” is the main focus before the NCAA Division III Championships at the end of the season. The brown and gold came in second last season in the Mets, and Bowser says that his team has to do a lot of reflecting as to where they are as a team this year compared to last in order to be successful this time around. Rowan hosts the United States Merchant Marine Academy this Saturday at 1 p.m. in their last home meet of the season.